The Fed has been controlling the short end of the yield curve since 2008, keeping rates essentially at zero and flooding the financial markets with liquidity. Their recent foray into “operation twist” is designed to keep longer-term rates lower. So their activities in the Treasury markets make yield curve analysis, risk free rate determinations or proper yield spread analysis completely irrelevant. Not only is the US tossing liquidity into the marketplace, but also banks around the world in an effort to stave off the effects of deflation or defaults caused by too much debt. So the financial markets continue to rise as liquidity is injected into the financial system, the only real inflation that is persistently showing up is in asset prices, not necessarily in the rest of the economy. Commodity prices have been beholden to the dollar’s fate and given that the US – at present – is the strongest among the 100 lb weakling group, the dollar is likely to remain relatively strong vs. global currencies. So what about the economy? The stock market has not reflected the economic outlook since the Fed jumped into the markets, so using the SP500 as an economic proxy no longer is prudent. In fact, the changes in the Leading Economic Indicators scheduled for this next month will revise their use of monetary aggregates as part of the puzzle. There are a couple of economic series that are worth taking a look at to attempt to ascertain overall economic health. They are not necessarily in agreement and may explain some of the cross currents that we see in the data. First up are the loans by large banks to commercial and industrial companies. Reported by the Federal Reserve (https://research.stlouisfed.org/fred2/series/ciboard) it shows the amount of loans made in billions of dollars. The data goes back to 1988 and shows a regular pattern of rising during economic expansion and contraction during recessions. Obviously with the most recent recession, the magnitude of the decline in loans was huge, falling by over 10% on a year over year basis, well in excess of the 5% declines experienced in the early 90’s slowdown and in ’01-’02. What is notable is that loan growth is back to normal 5-10% annualized growth and has been at least positive for the past year. While still not back to peak levels (it takes a few years to regain prior peaks), the growth indicates that at least at the corporate level, loans are being written. The flipside of that bit of good news may be found in funding costs, which have been pushed to nearly zero by the Federal Reserve. In a normal world, businesses engage in projects that provide a return above cost. So if costs to fund a project are at 8%, the company would choose only those projects it determines could earn something above 8% and reject those earning below that rate. However, in todays near zero rates, nearly every project, good or bad, gets funded. Here is where the discussion of misallocation of resources comes into play, without discrimination in the form of funding costs, any project gets pursued, even the bad ones. One other Federal Reserve release, bank credit is also showing signs of expanding. In this series, (https://research.stlouisfed.org/fred2/series/totbkcr) bank credit has been expanding at a very constant rate from the inception of the series in 1973, barely budging even during recessionary periods of between 5-10% on a year to year basis. This series too declined on a year to year basis late in ’09 through mid-’11 and is once again closing in on the 5% growth on a year to year basis. Bankers are obviously lending money, but just to corporate borrowers, as consumer credit continues to contract (outside of student loans). Businesses are able to get funding, government is making easy money available to corporations, but the key to the puzzle remains the consumer, notably lacking in the data above. The consumer, who does not have access to these various lending facilities, struggles to refinance existing loans or improve overall income levels, has been detracting from the economy rather than adding to economic activity. But just maybe with the employment picture improving, the consumer will once again take their place as the dominant player in the global economy. Let’s take a look at a couple of reports that may show a different picture. Yesterday was the usual release of the weekly jobless claims data, showing a surprising decline in the seasonally adjusted data and gets everyone excited that job growth has finally arrived, certainly now that the weekly readings have been below (and now well below) the magic 400,000 level. The above data has a seasonality look, which is why the Department of Labor tries to smooth the data by “seasonally” adjusting the data. 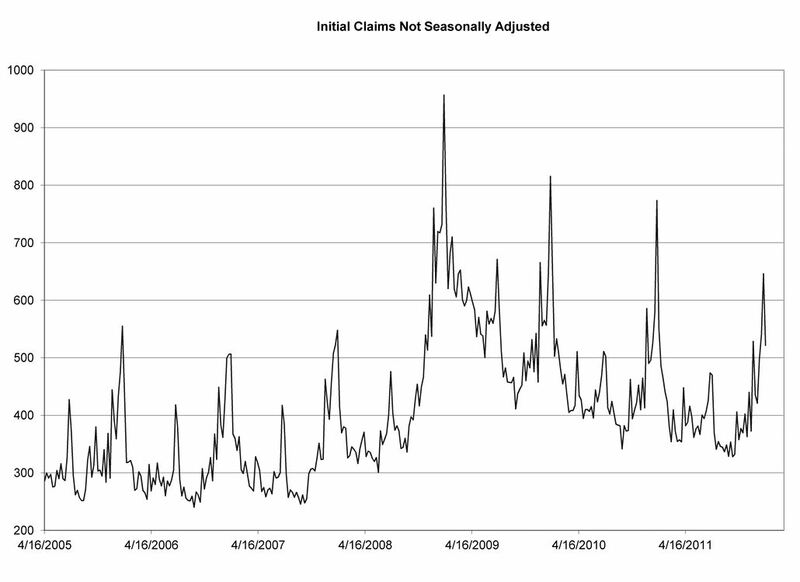 The spikes higher in the data occur the first week of every year, likely due to the Christmas “layoff”, following the seasonal hires. The data then begins to trend lower throughout the year and makes a bottom right around Labor Day (no really!) and again begins to rise into the first week of January. A better way to look at the data would be to compare this year to last year at the same point in time. That year over year comparison shows that the weekly jobless claims have been falling at roughly a 10-15% clip for the past two years, maybe not surprisingly coinciding with the monthly non-farm payroll data showing gains (albeit modest) vs. year ago levels for the past 15 months. So the labor picture is brightening just a bit, which bodes well for the consumer to finally get back into the game. Well…maybe not. There is a report from the Treasury department (https://www.fms.treas.gov/fmsweb/DTSFilesArchiveAction.do) that shows the daily Federal tax deposits for withholdings and totals (including corporate, indivdual, excise, etc). When looking at the monthly total deposits for this year vs. last year at this time, we see that for the first time the series is actually negative. What is interesting in this series is that the lead time for the “tops” in payroll data are well ahead of turns in the monthly jobs report. 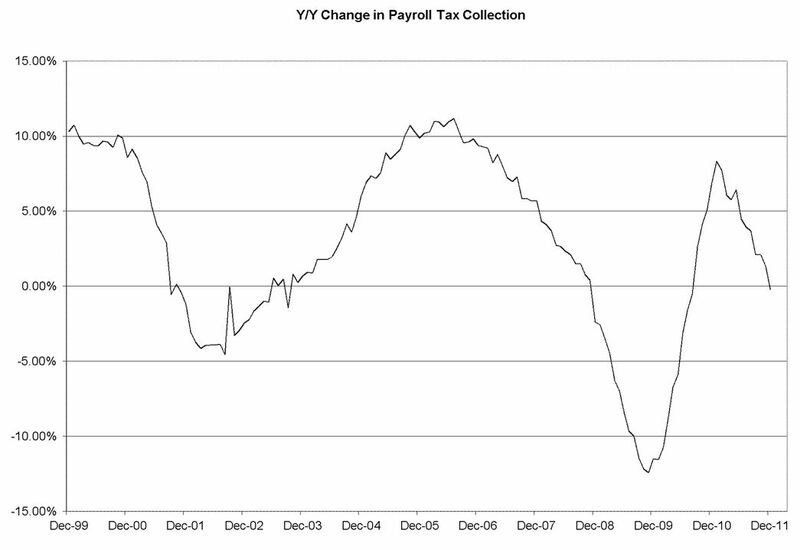 So one take-away from this data could be (and is merely speculation at this point) is that jobs are indeed being created, however they are not the higher paying jobs that were once held, leading to the overall decline in the payroll taxes. This too would explain much of the consumer behaviour of generally lower overall spending rates, housing activity remaining moribund and sentiment about the economy still rather punk. The economy today is certainly not that of your father or even an older sibling, as the “control” exerted by the Federal Reserve on interest rates at all parts of the curve is creating distortions in the economic data and in consumer/business reponses. The “recovery” that we have experienced has been wholly on the backs of business and government without the help of the once powerful consumer, who no longer has the ability to expand their balance sheets via credit. While the jobs picture has improved, the likely changes in the make-up of the labor force has created a situation where overall income growth remains extremely low by historical recovery levels, keeping the consumer further from “fixing” their debt levels to something more manageable. I believe the data continues to point to a bifurcated economy, split between the government (who can print money), business (who can still borrow) and the consumer (little access to jobs and credit). If the historical percentages still hold, that the consumer is (or at least was) two-thirds of the economy, the tepid economic recovery that we have experienced so far is soley as a result of the one-third trying desperately to pull the weak two-thirds along.